It’s widely believed that Norma Jeane’s Aunt Ana made this dress for her, though it has been said that it was borrowed too. It may be that the dress was borrowed and Ana made alterations to it. This dress was a typical 1940’s shape with slightly padded shoulders and narrow waist. It was full-length, covered in lace with ruffles around the neckline and shoulders, and long sleeves. 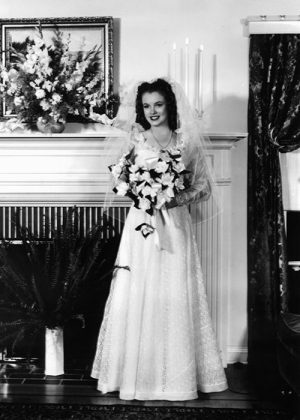 She wore it with a 40’s style headpiece and a medium length veil. This dress is the most traditional of Marilyn’s wedding dresses. Marilyn married DiMaggio in a civil ceremony at San Francisco Courthouse. On the day she wore a three-quarter length suit made of chocolate brown broadcloth, with a white ermine collar. The suit was buttoned to the neck and the collar held closed by a broach. 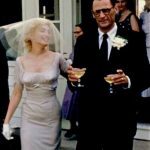 It was a big change from the low necklines the press were used to seeing Marilyn in, and is thought to be, in part, down to her wanting to please her new husband. 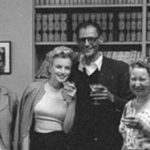 Writer Alice Hoffman was with Marilyn on the trip to San Francisco and has subsequently written that the suit was bought at the last minute – however, Marilyn wore the suit to meet the King of Greece just a couple of months prior, so we know that this can’t be true. Newbridge Silverware in Ireland had the honour of displaying this outfit in 2007, as part of their Museum of Style Icons. 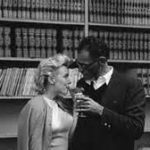 Marilyn married her third husband twice! 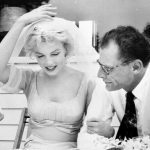 There was such a media frenzy surrounding the couple marrying that Marilyn and Miller decided to marry privately in a civil ceremony at the Westchester County Court in White Plains, New York, on June 29, and two days later had a traditional Jewish Ceremony at his agent’s house in Waccabuc, New York. 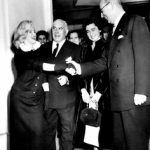 It was reported in the papers that Marilyn had worn a ‘sweater, skirt and no hat’, for the civil ceremony, by which they mean this beige sweater, worn with a pencil skirt. For the traditional ceremony, Marilyn wore a John Moore designed sheath dress in soft beige chiffon. The sleeves and bodice had ruching and there was a satin sash under her bust line. She wore matching satin heels and the white “halo veil of lace” was gift from Amy Greene that was soaked in coffee to attain a matching beige shade.